Here's my year-end tally of how many different planners I used in 2012. As usual, it's a lot! Interestingly, after I started using my self-drawn weekly planner in February (which is the same layout as my 2013 Plannerisms planner) I never switched around with the weekly planners again (except for a very brief experiment with Franklin Covey 2 Pages Per Day that quickly failed without my accompanying weekly planner). This is my ideal weekly format and I'm so excited it's been published!! The daily planners, however, were another matter and got switched around a lot. Jan 1-22: I started 2012 with my pocket size daily Moleskine diary, to continue using what worked so well for me in 2011. I also started using my 2012 large Moleskine Monthly Notebook that my mom got me for Christmas. I'm using the monthly calendars for overviews, the blank pages between each month for monthly goals and reviews, and the notes pages in the back for lists. It's super slim and goes everywhere in my bag, along with my pocket daily diary. So far I'm really enjoying using these two planners together. Jan 23-26: After using just daily and monthly planners for awhile, I was having a hard time planning at the week level. Dinner menus, task lists and appointments are easier for me to plan on a weekly spread. So I started using my 2012 Moleskine Bakin weekly planner. I still use my beloved Moleskine pocket daily planner for all my daily records, mapping out my day, etc, click here to read more about how I use this planner. And I still also use my Moleskine Monthly notebook for longer-range planning to see holidays, school breaks, travel and deadlines. For more info on how to use multiple planners simultaneously, click here to see my post about it. I've been using daily and weekly planners together for most of the past year, click here to see more details. Jan 26-31: After just a few days of using daily, weekly and monthly together, the system broke down because of too many places to write and look each day. (My limit is two places to keep up with on a daily basis.) I went back to using just my daily and monthly. Feb 1- 19: Total change-up! I'm using the Cotton Cream week on 2 pages diary insert in my new Aston Orchid personal size Filofax. I'm still using my pocket daily Moleskine as my daily record. My Moleskine Monthly Notebook is now my Goals notebook and where I write monthly and weekly reviews. Click here to see all the details of how and why. Feb 20-May 1: As usual when I use Filofax as my planner, it just didn't work so well. My to-do lists were behind a tab somewhere. I used my large Moleskine weekly notebook for a couple of days but decided I needed more structure, so I'm using a self-drawn weekly format that I drew up in a Leuchtturm dotted notebook. I'm still using my beloved pocket daily Moleskine diary too. And, my personal Holborn Zip Filofax goes everywhere with me as my Medical Filofax. May 2-23: After much difficult decision-making, I stopped using my Pocket Moleskine day per page diary. The bottom line is, the pages are just too small. I wasn't able to write as much each day as I wanted to. I felt sad giving up this planner because my kids have done such wonderful art in it, but I decided it was more important to have more writing space each day for capturing memories. Luckily I had on hand two 12 x 17 cm (4 3/4 by 6 3/4 inches = perfect size) day per page diaries, the Quo Vadis Notor and the Undercover UK diary. I went with the Notor for various reasons. You can see my video with details on why I gave up the Moleskine and pros and cons of the Notor and Undercover UK diary here. You can see my associated post here. Meanwhile I'm still using my self-drawn weekly planner in the Leuchtturm notebook, it is working very well for me. And my Holborn Zip Filofax is still my Medical Filofax. May 24-31: I'm moving in just a couple of weeks and am absolutely swamped with things to do before departure day. I've moved up to my large daily Moleskine planner to get me through the move with plenty of space to write lots of details. I describe this in full in this post. I'm also still using my self-drawn weekly + monthly planner extensively! June 1-August 4: I'm back to using my day per page Pocket size Moleskine. For the backstory, along with descriptions of why I've used (and stopped using) various day per page planners, and even speculation on what DPP I might use next year, see my video Daily Diary Litany here. I'm still using my self-drawn weekly + monthly planner, which I've been using consistently since February. I think this might be a record! I'm using my personal Aston Filofax for recording expenditures, budgeting, shopping lists and more. I wrote a post on this setup on Philofaxy, click here to see. I'm using my Moleskine Monthly Notebook as my blog planner, which is working really well. I love the big daily squares for writing in post titles, and the notes pages between each month for writing in post ideas, topics and themes. I color code for each blog so I can see at a glance when and what I'm posting for which. August 5- September 26: Still using my Mole pocket daily and self-drawn weekly + monthly. Plannerisms planners in my weekly + monthly format will be available to buy for 2013 soon! Stopped using my Filofax for financial recording, it was too much to carry in my bag and things got confusing. Still trying to figure out how best to record financial stuff. I think I'll get a little pocket size notebook to record expenditures so I can take it with me everywhere and not leave it at home. I'm using Charlie Gilkey's Blog Post Planner And Calendar, it is genius for categorizing posts and scheduling them easily. September 10-17: For a week I used Franklin Covey two pages per day inserts in my personal Filofax. You can read all about it and see tons of photos here in this post. I liked having plenty of space to write each day. But this system quickly broke down because I need to see a week view. The spaces in the monthly calendars weren't big enough to write reminders so I forgot things like my kids' library days at school and other things during the week. So I went back to my self-drawn weekly + monthly planner that I've been using for most of the year. September 27-October 26: After struggling for most of the year with the small daily pages of my pocket daily Moleskine, I finally gave myself permission to give it up. I switched to a 2012-2013 Quo Vadis Textagenda, which makes a brief appearance near the end of this video. I haven't reviewed this exact one, but you can see my review of the UK version here to see the format. I'm still using my self-drawn weekly + monthly planner. I actually drew up an academic-year one in a new Leuchtturm dots notebook (purple cover of course) but it's the exact same week + months format of the one I've been using since February. The 2013 version of this planner will be printed soon and available in November! October 27-November 21: After reading my post on the 2013 Quo Vadis ABP1 day per page planner (which I plan to use for 2013), reader Elsa very generously sent me her 2012 ABP1 that she didn't use this year, so I can start using this awesome planner right away! So now I'm enjoying the large page size and super-smooth paper in this lightweight book. I love it! I'm still using my self-drawn version of my Plannerisms weekly planner. The 2013 Plannerisms weekly planners will be available in a couple of weeks and I can hardly wait! I will make a huge announcement here on Plannerisms when they are ready! With the Quo Vadis ABP1 and my Plannerisms weekly planner, I may have reached Planner Nirvana at last!!! Watch this space!! November 22-December 18: Another switch-up with daily pages. As much as I loved the ABP1, it was too much in my bag with my info notebook and weekly planner. Around this time I bought my personal Malden Filofax, which I really like. So now I'm using Franklin Covey 2 pages per day inserts in the Malden, and I really like it. I never have to worry about writing too much on any one day, because I can always add pages. I'm still using my self-drawn Plannerisms planner until the end of the year, and I'm really excited to start using my wonderful published Plannerisms planner in 2013! December 19-Present: The impermanence of the looseleaf pages in my Filofax really bothered me. I like to use a bound book as a permanent record. I tend to switch pages around between my Filofaxes and sometimes they get lost. I had planned on using my large Moleskine daily for 2013 (you can read more about my 2013 planners lineup here) but after carrying it in my bag for a few days as a test I decided that it was just too big and heavy in my bag. I want a daily book that I don't mind carrying around with me absolutely everywhere. After some decision-making, I finally self-dated my Paperblanks Midi size journal with the beautiful Ventaglio Rosso cover. It's the perfect size for a daily book, big enough to write a lot but small enough to carry. I added in maps and other features. You can read all about how I set it up here. I created my Paperblanks day per page on December 24, starting that day so I didn't have to wait until January 1 to start using it. So there's what I used in 2012! For 2013 I'm very excited to use my Plannerisms planner! And it looks like this year I'll be using my self-drawn Paperblanks daily, similar to how I used a self-drawn weekly for almost all of 2012. I'm finding out that the only way to get everything I want in a planner just the way I want it is to make it myself! What will you use in 2013? So I've already changed my mind about what I'll use as my day per page planner for 2013. For the past two years I've used a day per page planner to record each day in addition to my weekly planner (which I use for all planning, scheduling and goal-setting). For 2013 I'll be using my weekly Plannerisms planner, of course, which I'm very excited to use! But I've gone back and forth a lot on which day per page planner to use. I like a fairly large page size, but I like to carry the book with me absolutely everywhere and if it's too big and heavy I tend to leave it at home. For most of 2012 and 2011 I used a pocket size Moleskine day per page planner, but finally gave it up a few months ago because the page was just too small for everything I wanted to write and record each day. In my post on my 2013 lineup I predicted I would use my large Moleskine day per page planner with the Magenta cover. I love the color and Moleskine's open daily format, but the book is just a little too big and heavy to carry everywhere. I carried it in my bag for a few days and it's more weight than I want to bring along with me everywhere. I considered going for a leather A6 size daily, because my favorite DPP I've ever used was A6 size and I loved how the book felt in my hands. But I feared the pages would be too small like the Moleskine Pocket was. Yesterday I showed my husband the large Moleskine (too big), a 2009 Time Traveler A6 day per page (too small) and my Paperblanks Midi size Ventaglio Rosso journal (perfect size). He, wisely, said, "Why don't you just make your own in the medium size book?" Of course! Originally I had been opposed to doing this because I couldn't fit an entire year in one journal due to too few pages. But I realized I could fit six months in, with plenty of pages for notes. The book is the perfect size (4 3/4 by 6 3/4 inches) to carry everywhere but the page is still big enough to write a lot. Below you can see my Midi Paperblanks is the Goldilocks of the planner sizes. The Large Moleskine (left) is too big for me to carry everywhere all the time and I end up leaving it at home most of the time, which defeats the purpose of having it on hand for recording expenditures and other notes. The black A6 diary on the right is nice and portable, but the page size is a little too small and for the past two years I've been wanting a larger page size. I think the Paperblanks Midi will be Just Right! It's the same size as two of my all-time favorite day per page planners: my Russian diary and my DIARYYYYY TWOOOOO THOOOOOOOUSAAAAAAAAAND, so I already know I like this size. The page is a good size for writing details, and the book is small enough to go with me everywhere. And it's such a beautiful book! I've been trying to think of a really good use for this book ever since I got it. You can see my review of it here from last spring with lots of photos of the features. I would have happily bought a Paperblanks Midi size day per page planner, which is available with several beautiful cover options (including this exact same one), but it has a fatal flaw: Saturday and Sunday share a page. I must have Saturday and Sunday each on a full page. So I went to work. My date stamper saved me a lot of writing. I wrote the days of the week in a different color for each month, for variety. **Edited to add: I'm using some of the extra pages in the back of the book as an index of events, like how Patty uses her index pages in her Franklin Covey. It's a line for each day so I can write any major events for quick reference. I'm also experimenting with some features in this book that I've been wanting but have never found in a day-per-page book. If I get my Daily Plannerisms planners published for 2014 they will contain these top-secret features! I tucked the address booklet from my pocket Moleskine 2013 Star Wars planner into the back, which looks really cool. That way I can transfer it to the next notebook I hack into my day per page planner for the rest of the year. Because it has fewer pages than a day per page planner (240 pages, to be exact) it's slimmer than a normal DPP. And it has a cool metal clasp and decorative page edges that add to the enjoyment of using the book! Because I wrote the dates in myself, I had the book start yesterday so I could start using it immediately instead of having to wait until January 1! I'm really excited about this as my DPP and I'm very happy I found such an excellent use for this beautiful book! Several people have asked me the difference between a goal, resolution, project and task so I thought I'd go into some detail on what each of these means and how you can apply them to your life. First I want to define a Resolution and how it's different from a Goal. Gretchen Rubin cleared this up for me in her book The Happiness Project (not affiliated, just giving credit). She points out that a Goal is quantifiable and has an ending. Running a marathon is a goal. You train for it, and complete the marathon. After that it's up to you whether you continue training or become a couch potato. A Resolution, on the other hand, has no end. It's a lifestyle change. "Quit Smoking" or "Be More Cheerful" are things that you'll have to continue doing for as long as you want to reap the benefits. Gretchen does point out that the more specific you are with your Resolutions, the more likely you'll be able to keep them. "Laugh at least once per day" is easier to keep track of than "Be more cheerful." Incidentally, a Resolution can become a daily Goal: did you laugh today? Then you can check off that you did, in fact, laugh today and thus have reached that small goal for the day. So let's talk about what, exactly, is a Goal. Goals can be long-term (complete university degree), shorter term (finish report) or just today (read Chapter 3). A goal is something you can measure, and you can complete in a specified period of time. As an example, let's talk about something many people set as a New Year's Resolution: Lose Weight. Unfortunately, Lose Weight is not a Goal. You can't measure it. How much weight? By when? "Lose 10 pounds" is closer to being an actual goal, but it's still lacking the time element. Lose 10 pounds at some point in your life? How about, "Lose 10 pounds by June." Now THAT is a Goal. You can do that. Here's how to break down the Goal of "Lose 10 pounds by June." How many months/ weeks do you have until June 1? This will tell you how much weight you need to lose each week. Generally 1 pound per week is sustainable, some people can even pull off 2 pounds per week. There are about 3500 calories in a pound of body weight, so to lose a pound per week you'll cut 500 calories per day. Science aside, eating less fatty and carby food and more veg and lean protein plus exercise will help you lose weight in a healthy and sustainable way. Keep it up until June, and you'll reach your goal. The other thing a Goal needs to be is trackable, and this is where most people succeed or fail. People who track their progress are MUCH more likely to reach their goal. Weigh yourself every week. Measure your waist. Count calories if you can stand to, or food points, or the number of fruit and veg portions you eat each day. Record your exercise. When you track your progress you know what you've accomplished and how far you have yet to go. You also notice setbacks and can get yourself back on track. What's the difference between a Goal and a Project? Or a Goal and a Task? Timeframe, mainly. For example, you may have the goal of painting your living room. Remember, to be a true Goal you need to set a time limit, so let's say you want to paint your living room before your in-laws visit 3 months from now. This is an example of a Goal that is also a Project. A Project has multiple steps. Think of all the things you have to do BEFORE you actually apply paint to your living room walls. Research paint types and choose colors. Buy brushes, tape, and plastic to cover your floor. Prepare the walls by removing old wallpaper, filling any cracks or holes, and smoothing the surface. Move furniture, cover the floor, tape edges. THEN you can actually paint. Then let the paint dry, apply another coat if needed, dry again. Remove the tape and floor coverings, move furniture back into place. Done! Each of those steps can be considered a Milestone toward reaching your goal of painting your living room. Milestones need to have a time element of their own. Back-count from the Done date to figure out the deadlines for each Milestone. How long will it take you to research your paint options? When will you actually have time to go buy the paint and supplies? When will you do the actual painting? Look at your planner and schedule time to complete each of the Milestones. Now you'll know if you're on track to reach your Goal in time or not. Your in-laws are coming next weekend and you haven't chosen your paint yet? Unless you've got the week off work, you might not reach your goal. Think realistically about how long it will take you to complete each step to make sure you have adequate time. Each Milestone can be broken down into individual Tasks. A Task is sometimes called an Action or a Next Action. For example, the Milestone of Choosing Your Paint can be broken down into several tasks: Look online at paint brands and types. Look up customer reviews of different paints. Go to the store to look at paint colors and types. Ask someone who knows about paint what they recommend. Get paint samples and bring them home to get an idea of what the colors would look like in that room. You get the idea: a Task is something you can do without having to do something else first. Unfortunately, in real life most goals aren't as clear-cut as "Lose 10 pounds before June" or "Paint the living room before 3 months from now." Maybe you want to get a promotion at work, publish your e-book, make more friends, or improve your credit rating. Whatever your goal is, be sure to set a time frame, break it down into actions, and measure your progress. I designed the Plannerisms planners to give you space to write out your big Annual Goals, break them down into Quarterly Milestones, Monthly Goals and Daily Tasks. Importantly, there's space to record your progress every step of the way so you can see what's working and what's not, and exactly how far you have to go to meet your goals. Click here to see my post on Using the Plannerisms Planner as a Goals Workbook. Was this post helpful? Any questions about setting goals? They are my 2013 Plannerisms weekly + monthly planner, my 2013 day per page large Moleskine with the magenta cover, a large Moleskine lined Volant notebook, and the enormously cool Moleskine large lined Hobbit notebook! Each book has a specific, different purpose. The star of the show of course is my 2013 Plannerisms planner. This is the planner I designed as My Ideal Planner. It has a week view with the days as columns, month on two pages grid calendars, loads of goals pages, and more. Click here to see my post with tons of photos of the pages and features of the Plannerisms planner. This is the weekly format I drew up in a notebook and have used for most of 2012, and it's the best format I've ever used. I use the column before Monday for goals and the space below the days for my weekly lists. Click here to see my post with loads of ideas on different ways to use this weekly format. For the past two years I've been using a weekly planner for all forward planning, and a day per page planner to plan and record today only. This system works great for me because it's the perfect combination of planning ahead and plenty of recording space. Because I use only my weekly for forward planning, and my daily only for today, I don't have to synchronize them so nothing falls through the cracks. I've changed my mind a lot this year on which day per page planner to use. For the past few weeks I've been using my Franklin Covey two pages per day in my Malden Filofax, but I have to admit the impermanence of the looseleaf pages is really bothering me. Starting January 1 I'll use my large Moleskine day per page with the magenta cover (which I reviewed here). I like the color of the cover, and I love the open format of the pages. It's a little heavy, but not horribly so. Because my Plannerisms planner is so thin and light, I don't mind carrying both books in my bag. I'll use the Moleskine's monthly columns with a line per day as an index like Patty uses with her Franklin Covey pages so I can quickly and easily reference important events. For notes that won't fit on the Moleskine's daily pages, I'll use the pink covered Moleskine Volant notebook that my sister sent me a couple of years ago. I have numbered the pages and put an Index in the back so I can easily find notes. In my daily Moleskine I'll write the page numbers of the Volant with notes that are relevant to that day so I can cross-reference. **Edited to add: I carried the large day per page Moleskine in my bag for a few days to test it, and discovered (as I have before with this size book) that it was bigger and heavier than I want to carry everywhere. I need a day per page book that I don't mind carrying with me everywhere I go, but still has a large enough page size. So I created a day per page diary with extra features I like in my Paperblanks Midi size journal with the Ventaglio Rosso cover. You can click through here to read all the details about that. For a few years I've been inconsistent in using a large day per page Moleskine planner as my journal. For 2013 I'm starting fresh with an undated, large lined Moleskine Hobbit notebook as my journal. It is so very cool and I'm excited to start writing in it! So those are my intentions for 2013. I like the permanence of using all bound books, I like being able to plan ahead in my weekly and record each day in my daily, and I like being able to reference page numbers in my Volant. I'm looking forward to the freedom of using an undated book as my journal. Will I stick with this system for all of 2013? Only time will tell! Please email me at Laurie at Plannerisms dot com and send me your mailing address so I can get your new Plannerisms planner out to you right away! For those of you who didn't win, I hope you'll try a Plannerisms planner. It might just be your answer to Planner Nirvana for 2013! Click here for info on how to order. I've had loads of great feedback from people who have bought the Plannerisms Planners! Thanks for your wonderful comments everyone! Josh had a lot of great things to say about the 2014 Plannerisms planner in his video review! Thanks Josh! Cruz did a great post on how he uses the various pages in his Plannerisms planner! Take a look at TannieSpace's excellent post on how she uses her Plannerisms planner with extensive fountain pen ink tests! Check out Inkophile's wonderful review of the 2014 Plannerisms planner! Angela did a great review of the 2014 Plannerisms planner at Paper Lovestory! And see Amanda's thorough review on Paper Pens Ink! The Perpetual Student has done an excellent post showing how she is using her Plannerisms planner. I love seeing her photos on how she customized the pages to suit her needs! Click here to see her post. Femke also customized the pages in her Plannerisms planner that she won in the giveaway here on Plannerisms, see her excellent setup here! Click here to see how Jotje uses her Plannerisms planner to track household chores and personal habits. Stephanie shows us lots of details on how she uses her Plannerisms planner and her Filofax together, click here to see. my Plannerisms Planner arrived today ( I´m lucky, I got one of the last ones in purple ;-)) and it is FANTASTIC!! Great size, great paper, great layout - one can see that a lot of work and thinking went in it. Just what I was looking for. For now I think I´ll use it as a goals planner (work+private+housekeeping) but maybe I even change my forward planning to it, too. The layout is excellent and gives you lots of freedom to use it. If there is one thing I miss it´s that I couldn´t find neither german nor spanish holidays in the International Holiday section ;-) - but I can easily copy them from internet etc. Thank you once again, great work! got my planners and they are AMAZING! I'm already filling out my class schedule and everything for the coming year! Thank you for making such an amazing planner! I just received my Plannerisms Planner and it is fantastic! It is just what I need and has great flexibility. I am going to spend some time working out how best to use it, but I can see all the work that went into designing it. (I ordered one for my DH). The quality is outstanding and the paper is soooo smooth! I'm almost hoping DH won't use it, because I immediately had some great ideas how I could use it myself (he he). Sadly for me, he was very impressed. And I have to add that the Filofax, Moleskine and Flex I ordered for him in the pass totally failed to trigger anything. Hi Laurie, my planner arrived y'day & i totally agree. Super planner, looking fwd to using it in 2013. Many thanks. Your planner arrived yesterday. Amazing quality! The paper is delicious & the monthly boxes huge! BF is eager to fill it up! Planner arrived and looking good, can't wait to start using it. Well done! The Plannerisms Planner is simply the best planner because it keeps me focused on whats important: my goals. Having annual, quarterly and monthly goal pages has been the key to me getting things done, doing what's most important to achieve my goals while also keeping track of appointments and other todos (those that "just need to get done" but don't necessarily add anything to my goal). Thanks again for making this planner!! Huge thanks to everyone for all of your wonderful feedback! For more information about the Plannerisms planners and how to order, click here! This giveaway is now closed. Check the post on Monday December 17 to see who won! After years of reviewing and trying hundreds of different planners, I never found what I was looking for. I designed the Plannerisms planner as my Ideal Planner. Click here to see my post with loads of photos and details of the pages and features of the Plannerisms planner. The Plannerisms Planner has a unique weekly layout with a column before Monday for writing your goals that week to check off each day, and space below the days for your to-do lists and notes. Click here to see my post with lots of ideas on different ways to use the flexible weekly layout. There are also monthly grid calendars, and a lined two-page spread between each month to write your monthly goals and to record details. There are annual planners for 2013 and 2014 so you can see an overview of your entire year. There's a pocket in the back that's open at the top to stick in papers, tickets, bills and anything else you like. What makes the Plannerisms planners unique is the multitude of pages for your Annual, Quarterly and Monthly goals, with space on every week's pages for your daily goals. You can track your goals all year and know exactly how close you are to reaching your goals. Click here to see my post showing all the Goals pages throughout the book with ideas on different ways to use them, and click here to see my video on the Goals pages with suggestions for use. 1. Post a comment on this post. Your comment is your entry, only one entry per person please. Everyone worldwide can enter! 2. Entries will close at 6 pm London time Sunday December 16. The winner will be randomly generated via Random.org. 3. The winner will be announced Monday December 17 here on Plannerisms. 4. The winner must email me with their mailing address so I can send you your prize Plannerisms planner. 5. If the winner does not email me by Friday December 21 I will choose a new winner. That's it! Please Retweet and Share this post so everyone has a chance to win! The Plannerisms planner has Goals pages throughout the book to help you incorporate your goals into your daily schedule. Or it can be used as a Goals workbook/journal separate from your planner, if you like. It has lots of pages for goals: Annual, Quarterly, and Monthly with designated space on every weekly page for your goals every day. There are also pages near the end of the book for your Annual Review. The planner is designed to guide you through the goal-setting process in a flexible and adaptable way. I did a video on using these pages for setting and reviewing your goals, which you can click here to see. In this post I want to expand on that video a little bit, and also give suggestions for using the Plannerisms planner as a Goals Workbook/ Journal. 1. Determining your goals. What do you want to accomplish? 2. Set milestones. What are the steps you need to take to reach your goals? How can you break down each goal into actionable steps? 3. Record your progress. Write down miles run, weight lost, seeds planted, projects completed, books read, etc. 4. Evaluate your progress. By figuring out what worked, you know how to replicate your success. By figuring out what didn't work, you can find ways to adjust your effort. Unlike most other planners, the Plannerisms planners give you plenty of space to plan and record your goals, and to evaluate your progress. Many people are good at setting their goals, but often don't follow up with the key steps of recording and especially evaluating. Recording your progress is one of the most important things you can do to help reach your goals. And evaluating your progress is probably the most neglected step in reaching your goals. By recording your progress, you know exactly where you stand. Is your weight/ blood pressure decreasing month by month, or not? How many pages of your dissertation have you written this week? Have you completed your daily tasks relating to your goals? When you record your progress, you know what you've done and what you are yet to do. And, you get a sense of accomplishment when you see your completed tasks and goals. Evaluating your progress takes the process one step further. What worked? What didn't? What did you accomplish, and how did you do it (so you can reproduce your success)? What got in your way? Was there an unexpected increase in workload, an illness, or something else that prevented you from completing your goal tasks? How can you work around it? So let's talk about how to use the Plannerisms planner for determining your goals, setting your milestones, recording your progress and evaluating your progress. Below is a photo (click on any photos to enlarge) of the Goals This Year pages at the beginning of the Plannerisms planner. This is where you will begin to determine your goals. Think about the year ahead. Consult the Year Planner pages to map out your year. What do you want to accomplish? Dream big, and most importantly, write it down. You can categorize your goals into Personal, Health, Work, Family, House, Finances, Gardening, Crafts, Books, Study, Volunteer, or anything you can think of that you want to accomplish or improve upon this year. These pages are not structured so you can use them any way you want. Next are the Quarterly Goals pages. This is where you start to break down your Annual Goals into milestones. Look at your goals topics and decide what progress you want to make in each quarter (or season). Think about how to break down your big goals into manageable chunks. If you are using this book to help plan your gardening, this would be a good place to record seasonal activities. Alternatively, you may want to concentrate on certain goals during a particular season or time of year. These pages help you focus on what needs to be done at which time of year. This gets you ready to break down your goals by month. I recommend writing your monthly goals at the beginning of each month rather than writing every month's goals for the entire year. This allows you to be flexible, change your goals if you need to, and base your month's goals on your previous month's evaluation. Here is a monthly spread, which gives you an overview of the entire month. Think about any major events happening this month, holidays, birthdays, deadlines and anything else coming up, and fill them in. The column before Mondays is great for highlighting things that need to happen in a particular week, or anytime that month. Here's one example of how to use the monthly calendars: On the day spaces on the monthly pages I like to use symbols to indicate when I exercised. I use green ink, just to distinguish it from other things on the page, and I use a C for Cardio and S for Strength. That way I get a quick and easy visual if I'm exercising most days or if I have gaps of more than a few days. You can use this technique for anything you want to do each day. I read somewhere that Jerry Seinfeld marks an X on his calendar every day that he writes. He doesn't want to "break the chain," so the marks on the calendar are incentive for him to write so he can fill in his daily X. If you have several things you want to accomplish daily, or need to fill in details, you can record them all on the weekly pages (more on that in a minute). Between every month there's a two-page spread for your goals and tracking that month. The monthly Goals pages are not for filling up with so many goals every month (unless you are VERY ambitious!). These pages are for listing your monthly goals then tracking them, and evaluating your progress. This is the place to break your Quarterly (Seasonal) goals down into what you can focus on this month. Use these pages to record and evaluate your goals each month, including your Monthly Review. Your Monthly Review lets you evaluate your month and find out how many of that month's goals you were able to complete and what you still need to work on next month. Did something come up that set you back? Come up with ways to get around obstacles and move forward. The monthly Goals pages are a great place to record data relating to your goals like: financial totals (I like to record monthly totals for checking, savings, and credit cards to keep an eye on my savings and what I owe); miles run or other exercise info; weight, blood pressure, blood sugar levels or other health tracking; and anything else you are keeping track of. I use my monthly Goals pages to track household cleaning schedules, irregular or unexpected expenses (regular monthly expenses are in a list in the booklet in the back pocket), household maintenance like changing smoke alarm batteries, and anything else I need to keep track of. In this post I showed examples of how I use my monthly Goals pages and gave more ideas on how to use them. You can also use the pages between the monthly calendars as an index for each month like how Patty uses her Franklin Covey index pages, which you can see in her post about it here. But as with all the Plannerisms pages, there's no prescribed way to use the monthly Goals pages and you can suit them to your individual needs, even using them differently each month if you want. There are so many ways to use the weekly pages. In my post on how to use the weekly pages, I focused on using it as your planner and incorporating your goals into your daily schedule. But you could easily use these pages to track daily goals and keep your schedule someplace else (electronically, in your Filofax, etc.). Below is the photo I showed in my weekly pages post for filling in exercise, meds, vitamins and stretching. You could definitely use the Plannerisms planner as a fitness log for recording your exercise, how it felt, tracking your progress etc. There are endless uses for the daily columns and the Goals column before Monday. You could write in your daily routines (like FlyLady's Morning, Afternoon and Evening routines) and check them off each day as you go. If you need to make sure you are drinking at least 8 glasses of water or eating your 5 fruit and veg per day, you can write that in the column and put a check for each glass of water or fruit/ veg to see your actual intake. You could also use the column before Monday to list your daily Resolutions for those of you who are working on a Happiness Project like Gretchen Rubin's book The Happiness Project (which I have read and am not affiliated with). Whether your Resolutions are to make your bed every day, journal daily, have more positive interactions or appreciate your surroundings, you can track how well you're sticking to your resolutions by marking them off each day. Gretchen strongly recommends tracking your resolutions, and this would be an easy way to do it. You can divide the daily columns so you can easily track goals in different categories for a quick-glance indicator of if you are sticking to your plan. In the space below the daily columns you can write your Weekly Review. This is a good place to evaluate your week, what went well, what you accomplished and what you still need to work on. Evaluating each week can be intense, and some people feel that a mid-month or even just monthly review is enough. What ever works best for you is great, but make sure you do evaluate on a regular basis so you know if things are working or if you need to adjust your strategy. At the end of the book is a two-page spread for your Annual Review. At the end of the year, look back through your Goals from the beginning of the year, your Monthly and Weekly reviews. Evaluate your accomplishments and celebrate your successes! Look at goals that you didn't manage to accomplish and figure out why not. Did something come up that prevented you from reaching that goal? Did it require more time or effort than you expected? Think of ways to adjust your efforts so you can accomplish these goals. You may find that some goals became irrelevant over the course of the year, or that your attention was spent elsewhere. Some goals may be eliminated, or put on a lower priority than others. After tracking your goals all year you'll have a complete record of your accomplishments, so you can replicate them! As you can see, there's tons of ways to use the Plannerisms planner to track and evaluate your goals on a daily, weekly, monthly, quarterly and annual basis. And yet, there's no pressure. If you want to use the monthly pages for something and the weekly pages for something else, go for it! I've just loaded a couple of videos onto YouTube showing my new Plannerisms planners! Use the column on the left before Monday to list your daily goals, then check them off in the day spaces as you complete them. This way you don’t have to write “Exercise” or “Take vitamins” every day. The checkmarks are a great visual indicator of whether you are meeting your daily goals. The goals written in the column are a daily prompt to remind you of what you want to accomplish each day. When you record your completed daily goals, you don't have to take up an entire line for each thing. You can just write a checkmark to indicate you have completed that goal for the day. It helps to color-code and correspond the check to the goals. This works well for tracking your water or fruit/ veg intake too. Alternatively, you can write the names of your family members in the left column, then in the daily columns you can write each person’s activities for each day so you know who is where and when. Another option is to divide the daily columns into Appointments/ Tasks/ Reminders, or Work/ Home/ Personal, or anything else you like. In the daily columns, write in appointment times and circle or highlight them to stand out. Write in tasks to do that day. Arrow over undone tasks to the next day. Too many arrows means you are procrastinating! Use the bottom of the daily columns for menu planning, daily totals, or any other notes for that day. Use the space below the days for To Do lists. It helps to categorize lists. You can write a list of Things That Must Get Done This Week and another list of Non-Urgent Tasks. You can categorize your lists into Work/ Home/ School/ Family. Or, you can create lists by project. Experiment to see what works best for you. This open space is also a great place to capture phone numbers, notes and reminders that otherwise would get scribbled on a scrap of paper and lost. What I love about the weekly pages is they are so adaptable, I can use them any way I need to! And the flexible format easily adapts to my needs even when they change week to week. I've had great feedback from customers on how they are using their Plannerisms planners. 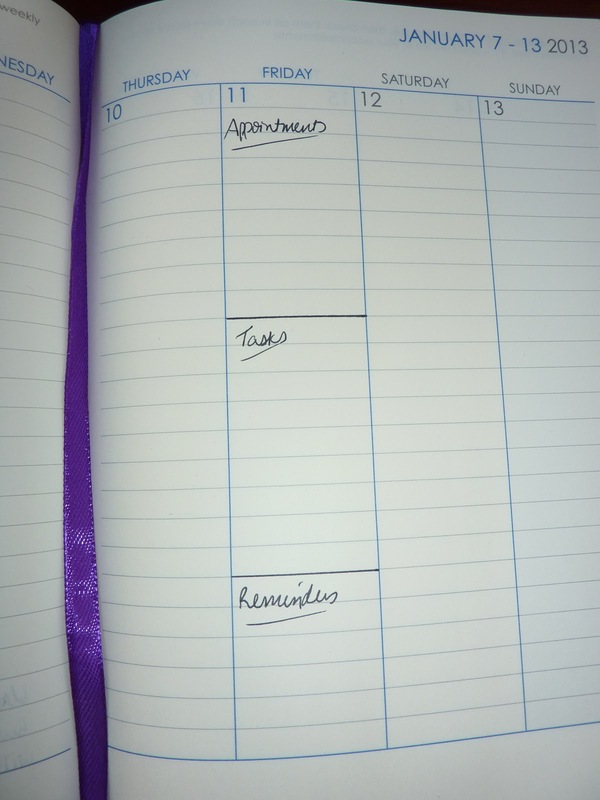 Customers have told me they are using their Plannerisms planners as a teacher's lesson planner, as a household maintenance and chores tracker for the whole family, as a goals workbook, in conjunction with their Filofax, and more! Click here to see different ways people use this flexible format! Please note this is an old post and the 2013 Plannerisms planners are no longer available. They're here! Check out the photos below of my new Plannerisms planners! This is an absolute dream come true for me! I designed these planners as My Ideal Planner, and holding the finished product in real life is a huge thrill! I designed these planners to be used by anyone, in any situation, for any purpose. They are great for work, home, school, personal, and any combination thereof. So let me give you a tour through the Plannerisms planners! Click on any of the photos to enlarge! The planners are 5 1/2 by 8 1/2 inches, so approximately A5 size. They are slim and light and will go everywhere with you in your bag. The covers are soft-touch PU and are so nice to hold. The cover color options are black, pink, purple and teal. The teal photographs as more blue than it actually is, it's really more greenish than shown. The covers have a very slight metallic effect which makes them change color slightly in the light, which looks really cool! Here's a closer look at the label. It's called the Going Places planner, for going places in life and in the world. If you click on the photo to enlarge you can see more details of the label. This planner has each week on two pages with the days as vertical columns, month on two pages grid calendars, and pages for goals. Also on the label you can see the paper is 84.3 gsm. It is cream color and suuuuuuuper smooth! There are two ribbon placemarkers, for marking your week and month, and a pocket inside the back cover. This quote inspires me when I'm feeling out of my comfort zone, like when I'm getting ready to move yet again or am adjusting to a new situation. It reminds me that I'll look back and be glad I had interesting experiences! The meaning of the logo is: The phase of the moon shown is a waxing crescent, which symbolizes optimism and growth. The changing phases of the moon represent the passing of time. The stars are reminiscent of celestial navigation used by mariners, representing movement in your world. So together the moon and stars symbol means optimism and growth as you move through your life in time and space! Next is a two-page spread to write out your goals for the current year. It's a great spot to get out everything and mind map/ brain dump, then you can organize it more on other pages. The best thing about all the goals pages is you don't have to use them in any prescribed way. You don't even have to use them for goals if you don't want to. You can use them for household maintenance, homeschooling, work plans, financial tracking, health and fitness tracking or anything else you want. I've written a separate post with loads of ideas on how to use the goals pages throughout the book, click here to see. Next there is a two page spread for Quarterly Goals all year. Again, you can use these pages for goals, reminders, tracking or anything else. For example, on the April-May-June quadrant, I wrote a reminder to myself to have our kerosene heating oil tank filled because it's cheapest that time of year. Next there is a two-page spread with the entire year at a glance, with the months as vertical columns. I love using these yearly planners for mapping out travel, holidays, school breaks and other major events. Next there are several pages with international holidays, dialing codes and conversions. Then there is a two-page spread with tips on how to use the different types of pages in your Plannerisms planner, to get you started. Next are the monthly calendars. I love the big daily squares! There's an empty column before Monday for writing in reminders, things due like insurance premiums or subscription renewals, or your Fly Lady Zones for each week. The weeks in the monthly calendars begin on Mondays, to correspond exactly with the weekly pages and to keep the weekend days together. But if you really want to have Sunday-start weeks, you could use that column before Monday as your Sundays and change the Sunday column to your notes column. Every month has a theme, and every week there are tips relating to that theme. Holidays are printed in the day spaces for the US, UK, Australia and Singapore. After every month there is a two-page spread for that month's goals, monthly review, to-do lists, household or garden maintenance, financial totals, exercise, or anything else you want to write in here. Here's the weekly spread (and here you can also see the book stays open and mainly flat on its own without training. With a little use it will stay open even flatter). I've written a separate post with ideas and tips on different ways to use the flexible weekly format and how to adapt it to your personal needs, click here to see. All seven days are same-size columns, so weekend days have as much space as weekdays. The daily columns are lined but not timed, so you can use them for appointments, tasks, reminders or anything else.You can write appointments at the top of the column and tasks at the bottom, divide each day into work/ home, write timed appointments all the way down, or any combination of these. You can use them differently as you need to. Before Monday there is a column to write in your daily goals. You can write things like exercise, vitamins, medications, journaling, working on your report or major project, or whatever else you want to accomplish every day. That way you don't have to re-write them every day in your day spaces. Then each day you accomplish your goal, you either write in the details (cardio 45 mins, strength, etc.) or just check it off on the day you did it. When you look across your week, you can easily see if you've been accomplishing your daily goals or not. It's a very nice visual indicator of whether you are working your plan or procrastinating. At the bottom of the weekly pages is space for lists, notes, and reminders. I'll do a separate post all about different ways to use this weekly format. It's very flexible and can be used in so many different ways. Below you can see on the right page there's space at the top for most important reminders, and space below the days for lists. I like to write my urgent lists on the left page under Monday so I see them at the beginning of the week, and lower priority lists on the right page so I can get to them later when I have time. There are two ribbon placemarkers, one black and one color matched to the cover, for marking your week and month pages. After all the weeks there is a two-page spread with the entire future year at a glance with the months as columns, for filling in appointments and reminders into the next year. The last page is a really nice full-color world map. Inside the back cover there is a pocket that is open at the top for sticking in papers or receipts. This is really nice for longer papers to stick out the top, and to keep things visible. It comes with an address booklet that you can move to your next year's planner. Also this pocket will fit a Moleskine Large Cahier notebook if you want more pages for notes. You can see on the reverse of the page that there is some show through to the other side with the wettest inks. At 84.3 gsm this paper isn't really designed for broad nib fountain pens (need at least 90 gsm for that) but I think it would work well with thinner nibs and not too sloppy inks. Any type of roller ball or other liquid ink pen works great, and I'll tell ya the paper is so smooth and gorgeous it's a joy to write on! Here are the cover colors again: aqua, purple, black and pink. Many huge thanks to everyone who waited until these were available to order your 2013 planner! Let me know how you like them!! Click here to see my videos on the Plannerisms planner features, and how to use the Plannerisms planner for goal setting and tracking. Click here for my detailed post on using the Plannerisms planner as a Goals Workbook.